Jenkins is a popular open source tool for build automation and continuous integration/continuous delivery (CI/CD). It has an impressive plugin architecture that enables development teams to automate their DevOps lifecycle. Jenkins Pipeline is very powerful for deployments in commonly used environments like Kubernetes development environments, and newer Containerized deployments. Like the Jenkins core, the Pipeline is also extensible by third-party developers. Kovair can help DevOps users easily execute and monitor Jenkins Pipeline Jobs. Users can also obtain real-time job status and reports that can help to perform predictive analysis. Kovair Intelligent DevOps is an enterprise solution that simplifies and automates execution and monitoring of real-time metrics. The core engine orchestration is done by Kovair Omnibus Platform and Jenkins tool. With the help of out-of-the-box adapters designed and developed by Kovair, you can establish a deep integration with Jenkins. The integration framework contains two components — an adapter and a plug-in. This integration — between Jenkins, Omnibus, and other ALM tools — provides a convenient way for managing Build, Build Steps, and Pipeline and eliminates the cost of a dedicated DevOps tool with single-click execution and holistic analytics. Why Integrate Jenkins with Kovair? Trends like Agile development, DevOps, and continuous integration/continuous delivery (CI/CD) have led modern enterprises feel the need for building software much more efficiently. With Kovair Omnibus, organizations can integrate all major tools in ALM with Jenkins for monitoring and taking actions in real time. 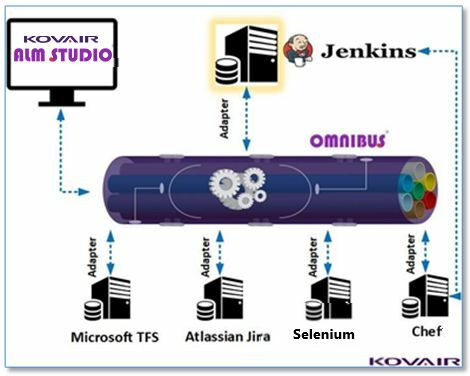 Kovair Omnibus being a proprietary Enterprise Service Bus, enables one to connect Jenkins with popular ALM tools like TFS, Jira, Selenium and others for coding, building, and deploying. Additionally, Kovair’s Omnibus allows for holistic tracking of issues, synchronization of Build-Steps and Pipeline execution results and these can be sent to Kovair ALM or any other tool. Kovair ALM along with Kovair Omnibus offers the capacity of supporting single-click execution of Jenkins pipeline. Jenkins Pipeline leverage the power of multiple steps for executing both simple and complex tasks based on the parameters that you set. Once created, pipelines can build code and orchestrate the work required to drive applications from commit to delivery. In contrast to freestyle jobs, pipelines enable you to define the whole application lifecycle. A pipeline provides functions to help Jenkins support continuous delivery (CD). The Pipeline plugin was built with the objective of creating a flexible, extensible, and script-based CD workflow. Kovair Adapter along with Kovair ALM can capture information related to the Jobs and the Pipelines and can display the status reports in a single interface as the central window for all key users. 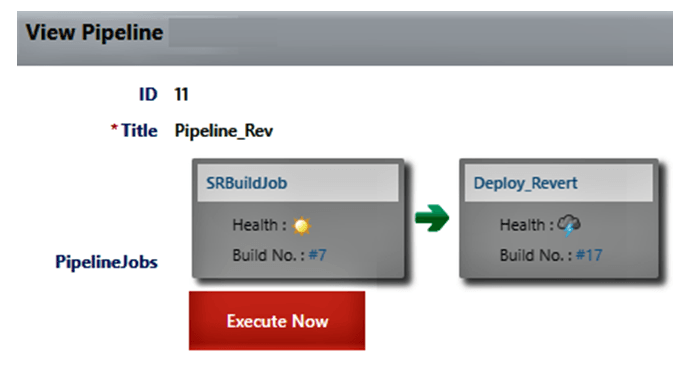 DevOps users can directly execute the intended pipelines from Kovair ALM Studio itself. The integration that is between Jenkins and Kovair ALM is a deep level integration. It enables users to implement deployments in a single-click from the ALM interface. Kovair with its rich integration adapter can extract pipeline as well as pipeline execution details to Kovair ALM Studio, which supports Source code repositories in any source control management tool like GitHub, TFS or SVN, while software deployment is made easier with Kovair integration with Azure, Chef, and Puppet. By using CI/CD tools like Jenkins, with Kovair, both engineering and release environment can be integrated and automated. Triggering builds or committing to a version control system becomes only a button click away with Kovair. Additionally, source code can be stored in any source control management tool like GitHub, TFS or SVN, while software deployment is made easier with Kovair integration with Azure, Chef, and Puppet. Next Post:Bridging Bi-Modal IT! The next revolution: Agile Tools for Everything! Thank you for sharing. Interesting post! My team would learn a lot just by reading this.